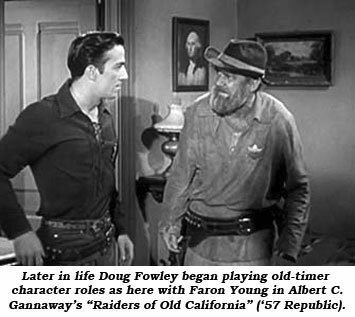 From debonair dress heavy to toothless old coot, Douglas Fowley did it all on screen from 1933-1981, a fabulous nearly 50 year career in over 400 film and TV shows, including a memorable stint as Doc Holliday on Hugh O’Brian’s popular ABC “Wyatt Earp” series from ‘57-‘58 and again from ‘59-‘61. Daniel Vincent Fowley was born in Greenwich Village, New York, on May 30, 1911, and aspired to an acting career from childhood. His father was an Irishman, John Fowley of New York, and his mother, from Ireland, was Annie O’Connor. After attending St. Francis Xavier Military Academy where he was active in school plays, he appeared in nightclubs as a song and dance man and acquired experience in stock. He even sang in backyards for change. Additionally, Fowley was a barker for theatres, a Wall St. runner, an athletic coach at a summer camp and worked in the shipping department of a silk house. For a time, later on, he ran his own drama school in Hollywood. 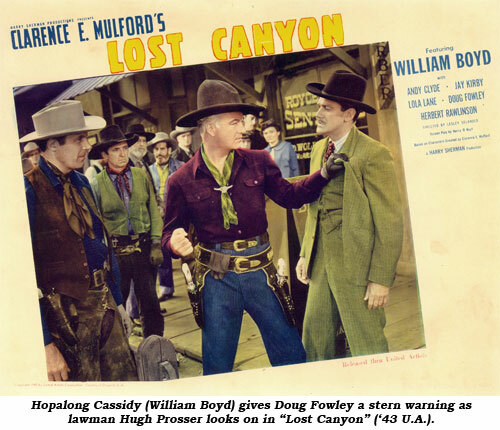 Fowley eventually gravitated to Hollywood where he made his movie debut opposite Spencer Tracy in “The Mad Game” (‘33). Soon the fast talking, sharp-tongued, handsomely mustached Fowley was seen playing everything from gangsters to reporters to military men to western heavies. His chameleon-like talent allowed him to immerse himself in a role. 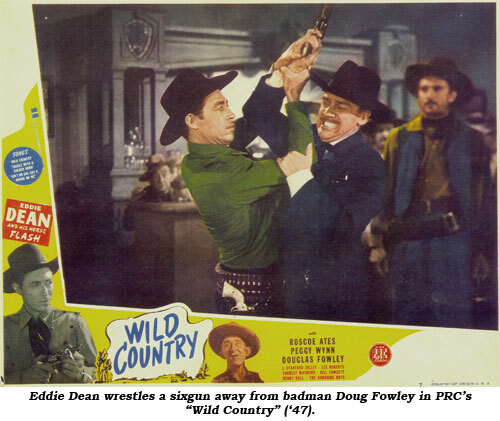 Always in demand throughout his career, Doug was able to mix major films like “Dodge City’, “It Could Happen to You”, “Riding High”, “Mighty Joe Young”, “Singin’ In the Rain” and “The High and the Mighty” with dozens of B-melodramas and comedies: Charlie Chan, Mr. Moto, Tarzan, Hopalong Cassidy, Laurel and Hardy, Kitty O’Day, Maisie, Gas House Kids, Joe Palooka, Blondie, and many more. He occasionally played leads as in “Lady In the Death House” (‘44) and “Yankee Fakir” (‘47). He even co-starred in one serial with Lyle Talbot, “Chick Carter, Detective” (‘46 Columbia). At the beginning of WWII Doug was 30, married and had one child, so was exempt from the draft until late in the war, 1944. He then served with the U.S. Navy in San Diego until the war was over in 1945. When he took out his upper plate to play the memorable role of smart-aleck Private “Kipp” Kippton who entertains his fellow GI’s by constantly clicking his poorly fitted GI issue false teeth in “Battleground” (‘49), Doug reinvented himself. As the years went by and he grew older, he often played a toothless old codger, both on film and TV. 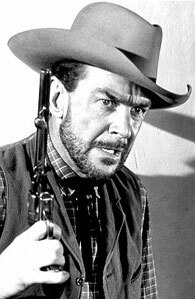 He was Grandpa Hanks on CBS’ western comedy “Pistols ‘n’ Petticoats” (‘66-‘67). As for “Wyatt Earp”, before he was Doc Holliday, he played the part of Doc Fabrique in Wichita during the first season (‘55-‘56). In 1994 Doug told us through his wife Jean, “I had a false upper plate, having lost my upper teeth prematurely in mid-life. I started playing old character roles by removing my false upper plate, adding a beard, voice and gait to match my interpretation. Fabrique was one of those characters. 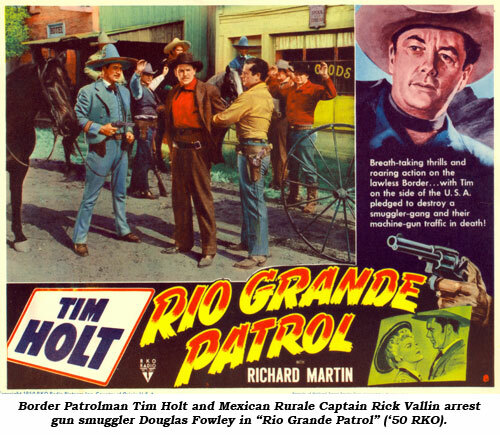 It was the part and association on the series that helped me (later) get the Holliday role.” (Episode #67 in ‘57). During the third year of the series Doug got a deal to do a picture in Europe while “Earp” wasn’t filming. The shoot went long and Doug wasn’t able to get back. Producers replaced him for episodes #105-150 (‘58-‘59) with Myron Healey. 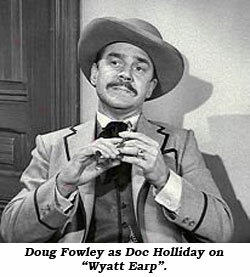 Fowley returned with episode #151 as the series switched from Dodge City to Tombstone and finished off the last two years of the popular series. Doug was married several times and had five children. With his pre-war romance and marriage to Shelby Payne (daughter of composer Rudolf Friml), there was son Kim, who was quite successful in his field of music writing and producing. After a break-up with Shelby, there was a wartime marriage to Mary Hunter in 1944 which produced a daughter, Gretchen and a son, Douglas Jr. After the war there was a divorce and a romance and marriage in 1947 to Vivian Chamber and a son, Kip. Following their break-up, Doug married Joyce Torstup in 1950 and had a son, Danny. All short-lived marriages, as were his marriages to Mary Ann Walsh (1954-1955), then Maria; with no children in either of these marriages. Only after not being married for a few years did Doug settle down and marry his long time dear friend Jean Louise Paschall in 1961. This happy marriage endured until his death. Doug and Jean had been living in Murrieta, California, but moved into the Motion Picture Television Fund’s retirement community in Woodland Hills as Doug’s health began to fail. One of our greatest character players and Western badmen died a few days shy of his 87th birthday on May 21, 1998, of heart disease at the Motion Picture Hospital. He is buried at Laurel Cemetery in Murrieta.